The list includes cricketer Mohammad Kaif and Bhojpuri actor Ravi Kishan. The Congress seems to have played it safe in its first list of candidates for 194 Lok Sabha seats, with party president Sonia Gandhi and vice-president Rahul Gandhi sticking to their pocket boroughs of Rae Bareli and Amethi respectively. The list includes UIDAI chairman Nandan Nilekani (Bangalore South), cricketer Mohammad Kaif (Phulpur), Bhojpuri actor Ravi Kishan (Jaunpur in UP) and former PM A B Vajpayee’s niece Karuna Shukla (Bilaspur). Union ministers Sushil Kumar Shinde, Salman Khurshid, Kamal Nath, Jyotiraditya Scindia, R P N Singh, Charandas Mahant, Mallikarjun Kharge, Milind Deora, Preneet Kaur, Girija Vyas and Jitendra Singh have retained their constituencies. Lok Sabha Speaker Meira Kumar has also retained her Sasaram seat. The list includes over 60 sitting MPs. 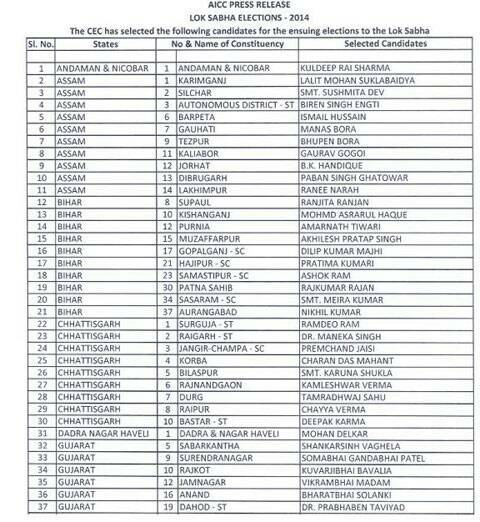 Maharashtra unit chief Gurudas Kamat will contest from Mumbai Northwest and Priya Dutt from Mumbai North Central. Rahul’s aide Meenakshi Natarajan, who won the primaries, is being fielded from Mandsaur, while former Kerala Governor Nikhil Kumar will contest from Aurangabad, Bihar. Other prominent names include President Pranab Mukherjee’s son Abhijeet Mukherjee and Adhir Ranjan Chowdhary.